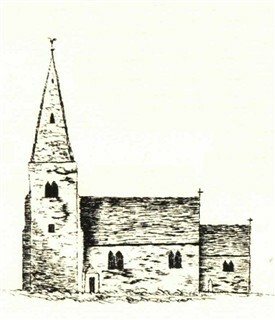 The three figures depicted in the drawing were unearthed at the site of the demolished church at Flawford (or Flawforth) in 1779 and were made of alabaster. The originals are now in the Castle Museum at Nottingham. This page contains information on the lost church and the finding of the figures. Interestingly, the date of 1773 for the demolition is nicely recorded by Throsby (2) where he says "In an old memorandum book, shewn me by the clerk of Ruddington, which was kept by an old schoolmaster, is the entry 'Saturday June 12th, 1773, Flawford Church was demolished by colliers"
About three years previously (ie c.1770) continues Throsby, "18 of 20ft of the spire fell, which in some measure hastened its final dissolution". Stone from the tower, he says, was used to mend roads, make pigsties and horse blocks, whilst gravestones from Flawford were seen to be lying in some Ruddington farmyards. "Last week as workmen were digging up the foundation of Flawford church.... they found three images of alabaster under the chancel, about two feet in length...."
"...the first [No.1 far left in the drawing above] was found a little defaced by the workmen, is supposed to be sa striking representation of the Virgin Mary, with a crown on her head, and the child Jesus on her right arm, clothed in robes of various colours, sculptured with great art, and strikes the beholder with wonder and admiration. The child hath its hands on her right breast, which is bare, and the hair of her head (as also that of the child) is richly ornamented with gold; her shoes are sharp toed, and she measures in height about 2 feet 4 inches. "The next image [No.3 far right in the drawing above] is a representation on St.Peter [to whom the church at Flawford was dedicated] habited in robes of variegated colours, with two keys hanging on his right hand; and holdingin his left the model of a church in the shape of a cross; a triple crown on his head, and at his feeta small figure in supplicating posture; a label has gone forth from his mouth, but the head and the label are broke off; and measures 2 feet 8 inches in height. 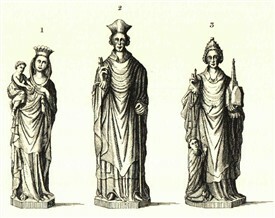 "The other figure [No.2 centre in the drawing above] plainly indicates the representation of a Bishop, the crosier in his left hand, and mitre on his head, do confirm this supposition; his right hand is erect; there is a ring on his second finger; and this beautiful statue measures 3 feet 2 inches in height. It is very probable that this figure may represent St.Paulinus, St.John of Beverley, or some one or other of the Archiepiscopal See of York, as it was found under the wall where the altar stood." Throsby, in his Antiquities of Nottinghamshire (1790-96, Vol.I p.132) says he, at that time, had the three statues in his possession. A note on excavations at the site of Flawford church (1) notes that the finding of the figures buried beneath the chancel floor probably indicated that they had been placed there at the time of the Reformation to save them from destruction. The same source says that the figures "were almost certainly carved in Nottingham and have been dated to pre-1370". The figures - known as the Flawford Alabasters - may now be seen in the Castle Museum at Nottingham. This page was added by Website Administrator on 25/11/2016.